If you’ve never been to CES before, it can get mighty tiring wandering around from Booth to Booth, looking at products. Some of them don’t look any different than others, so it makes it hard to find one that really stands out from the crowd. I did find some serious stand-out factor when I passed the booth for Wacom. This Washington state company is responsible for the Cintiq series of interactive pen displays that operate off a digital pen. We have covered them before, but I got a chance to see the Cintiq 12WX in action and was most impressed. All of the action involves pen-on-screen interface, with a very classy feel. It is about time that someone invented something that really emphasizes creative drawing in the digital world, without having to learn a new programming language. 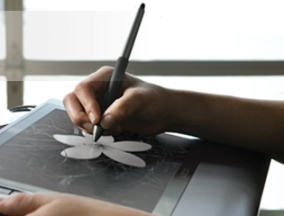 In addition to the pen, the user can also interface with the Cintiq using two touchpads. There is one on either side of the screen, and they can do nifty things such as magnification and the like. There is also some serious button action going on for some great hotkey applications. The Cintiq 12WX comes with a pen that allows the user to adjust for comfortable settings, and it is very comfortable to use. I believe that you can get this nifty device now for about $999.